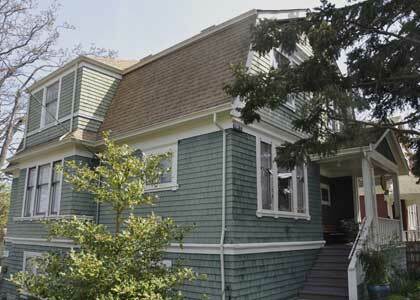 This 2-storey gambrel-roofed house is one of a mirror-image pair built simultaneously for $5,000. (For full description see 1857 Fern St) Some detail may have been lost when the side-facing, half-width porch was rebuilt. William Carl Van Munster, believed to have built these two houses, flourished as a Victoria contractor in the decade before the First World War, quickly making a name for himself after arriving from Holland in 1906. Typically, he seems to have built three or more houses a year, competing with other mid-level builders such as James Moggey, Robert Hetherington and the Jalland Bros. Building largely on speculation, he also contracted with local architects. (See 110 Medana St, James Bay, designed by C. Elwood Watkins.) He likely often used pattern-book designs, and may have erected some pre-fabricated kit houses. In 1907-08 he lived at 228 Memorial Cr (Fairfield), and then built 102 Moss St for himself in the gambrel-roof style, though his works appear to have been mostly in the Edwardian style. The first known occupant of this house was Alexander MacCallum (1873-1934), who lived here in 1909 with his wife Grace (Glover, 1874-1952). Born in Glasgow, Scotland, Alexander entered the banking profession at a young age. In 1897 he secured a position with the Bank of British North America, and became manager of the Victoria branch. In 1910 he was transferred to Brandon, MB, but returned to BC two years later to Agassiz, where he remained until retirement in 1932. There were then often periods of vacancy. Commercial traveller John Alexander and Jennie (Anderson) Oliver lived here in 1912, Miss Francis Boorman in 1921. The Standerwick family lived here from the mid-1920s-30s. Robert Sheldrick Standerwick (1872-1949) was a bookkeeper and later a mail clerk. Born in Bristol, England, he lived in Lethbridge and Taber, AB, before coming to Victoria in 1910 with his wife Mary (Kelley, 1877-1974), from Ireland. Maurice (1899-1983) and Mary Ellen (Sedgwick) Woodley lived here from c.1937 to the early 1980s. Maurice was born in Reading, England, and came to Victoria in 1911. He was an ironworker with Yarrows and VMD. In 1941, Mary Ellen’s mother Mary Ann Sedgwick (Eveleigh, 1877-1951) moved into the house after Mary Ellen’s father Charles (1882-1940) died. Charles was a contractor who came to Canada from England in 1905. He married Mary Ann in Victoria in 1908.